Departure Points: Departure from Rome via train or private transportation, departure from Naples via ferry. Enjoy a custom private tour of Capri. Your private Rome driver will transfer you from your hotel in Rome to the Naples ferry dock. You can also choose to take the fast train from Rome and our driver will meet you at the Naples train station. Take the ferry from Naples to Capri with your local, expert guide and start your tour. 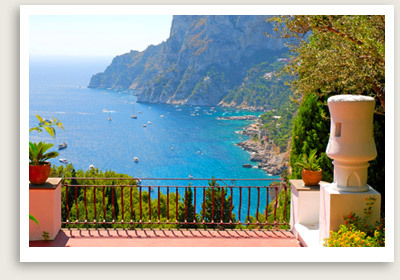 Your professional tour guide will take you to the picturesque island of Capri. A popular resort since Roman times, this beautiful island is a joy to explore on foot. As you explore this gorgeous island, you may visit historic sites like Villa Jovis (Tiberius Villa), Villa San Michele (a grand mansion), Church of Santa Maria del Soccorso and Charterhouse of San Giacomo, which was a Carthusian monastery. Additional Options: Visit to Anacapri, or Blue Grotto (depending on time of year), or leisure time shopping in the main square.